In this downloadable MP3, I will cover how to write a standout spec script drawing from my 18 years of experience as a studio executive and story consultant. I will go into my philosophy on what makes story work, I will go into the technical part of writing both scripts and then, I will give you examples of standout shows to illustrate what I am teaching. I will also tell you about a 5 week structure to adhere to while completing your spec script. 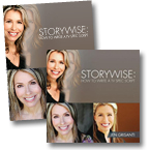 In the companion downloadable workbook, I will cover how to write a standout spec script, drawing from my 18 years of experience as a studio executive and story consultant. I will go into my philosophy on what makes story work. I will go into the technicalities of writing the script and then, I will give you examples of standout shows to illustrate what I am teaching. I will also tell you about a 5-week structure to adhere to while completing your spec script.